Chenbro Netserver Case A9891 PCSTATS Review - Here are the keys to your case sir. Abstract: Time for a case upgrade? What if you're running an FTP, or just have A LOT of gear to pack in your computer... Time for a server class case :-) Don't even think candy colours for this sucker! Here are the keys to your case sir. If there was ever a need to keep someone's hands off your computer - inside or out - this is the box to get. Power and Reset controls can be locked down, and access to the CDROMS requires a key. 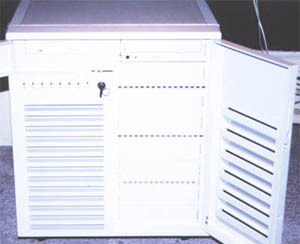 To get into the case a lock at the back must be released so that the back panel can be removed, enabling the side panels to come off. There is also a switch there, and one at the front - to tell if either of these doors (back and CDROM) are open when they souldn't be should your motherboard have that kinnd of detection capabilities. Access to removing CDROMs drives can be a bit tricky at first, as the entire front cover swings open via a semi-secret latch hidden off to one corner. Each of the drives is mounted on drive rails that have become pretty standard on any good case, and make removal a heck of a lot easier then with a screwdriver and the case on its side. To switch around the FDD requires a bit more work, a couple screws must be removed after the side panel has been removed. Generally, to access any gear inside the case is pretty effortless; unlock the back panel, and remove so that the side panels can be slid off (remove two screws per side). Looking at each side gives you an unobstructed view of everything that is there, and with no powersupply directly atop the CPU, removing cards or reconnecting the FDD cord to an Aopen board (why do they put it there!) is a breeze. 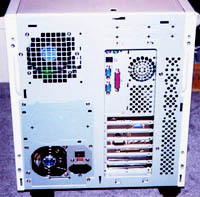 The layout of this case screams SCSI, and here's why. The motherboard is attached to a removable tray (it makes installing the board a lot easier) which then attaches to the partition. At the top and bottom of the partition are spaces to feed cable through. Considering the distances involved, IDE is not well suited to this case. It's a tight fit to get a CDROM and IDE harddrive in the drive compartment hooked up to the motherboard with one cable. There is a space under where the floppy goes where the harddrive could easily go, but with the way things are configured two cables would absolutely be necessary, and that one cable could only be used for that device. Likewise for the CDROM, don't expect to get more then one, or possibly two devices there. 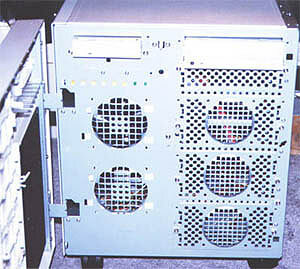 A good powersupply is a must for this case, not only for Wattage, and cooling, but for the length of leads it has. The case does not come with a powersupply (unless you want to pay a few hundred more) We chose to use the 350W Enermax($70 CDN) we have talked about before because the wires are about a meter long and easily reach everything in the box across the partition. 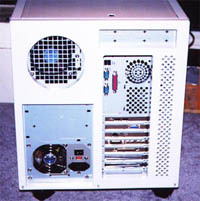 It also has two very large ball bearing fans to keep itself cool, and exhaust some of the air from inside the case. Pg 2. — Here are the keys to your case sir.